the sufficient; that the development objective is achieved more quickly than with the wind tunnel. The present publication will show how far CFD has come towards fulfilling both conditions. The different methods in numerical aerodynamics will be explained, along with their merits and drawbacks, and the importance of experimental validation will be emphasised. Prospects for improving the quality of CFD in the near future will be highlighted. Several examples from real development projects will be shown. The authors are a team of experts from the automobile industry, code developers and vendors, research organizations, and academia. 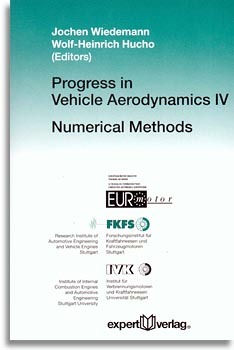 All have contributed substantially to vehicle aerodynamics and specifically to numerical methods, and are currently active in the subject they are presenting. The Editors, Professor Dr.-Ing. Jochen Wiedemann is director of the Institut für Kraftfahrwesen und Verbrennungsmotoren (IVK), Stuttgart University, and the Forschungsinstitut für Kraftfahrwesen und Fahrzeugmotoren Stuttgart (FKFS). Dr.-Ing. Wolf-Heinrich Hucho is a consultant in applied aerodynamics. He is the editor of “Aerodynamik des Automobils”/„Aerodynamics of Road Vehicles“ and the author of „Aerodynamik der stumpfen Körper“.